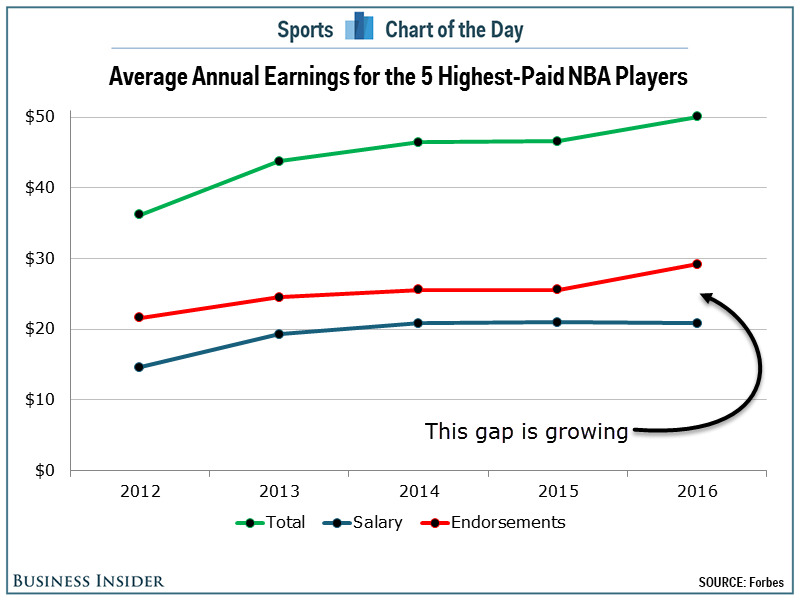 There has been an interesting shift in how the top NBA stars make their money and it could have a huge impact on the competitive balance of the league: for the top players, more and more of their income is coming from endorsements. Forbes has released their annual list of the highest-paid athletes, and the top-5 NBA players made an average of $50.1 million this past year, up 7.5% from the top-5 NBA players a year ago. What is interesting about that is that the average salary was actually down a notch ($21.0 million to $20.9 million), while the average amount made from endorsements is up 14.1% (from $25.6 million to $29.2 million). 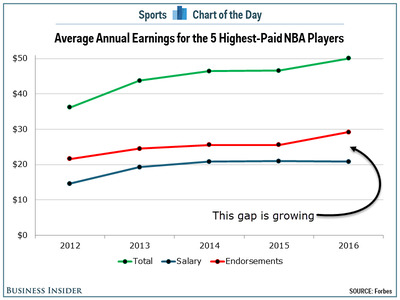 This could potentially impact the future competitive balance of the NBA as fewer of the top players rely on their salary as their main source of income. Will Kevin Durant be more likely to leave the Oklahoma City Thunder — where he can make more money under the NBA’s contract rules — knowing that he makes nearly $40 million in endorsements? Will LeBron James be temped to leave money on the table in Cleveland and form a super team somewhere else knowing he has a lifetime contract with Nike that will pay him more than $1 billion? On the other hand, there is also the looming surge in the salary cap which will mean an surge in salaries for the top players. That will narrow the gap. But it will also likely just be temporary as endorsement deals continue to soar and the NBA settles down under the new salary-cap ceiling. At the end of the day, only time will tell how many of the NBA’s stars will grow less concerned with maximizing their earning potential on the court. But what is clear, is that those salary numbers are growing less important and that is going to be a huge factor moving forward.